It felt like a really perfect storm of so many things, that if we do make a second one, I think we’re setting ourselves up for disappointment. I don’t know that anything will match up to the first, you know? Yes special as in ..$$. I’m sure if the offer is right you’re in..
Why such a churlish response? So unnecessary …. Good thought to keep it relevant, marketing etc. There is the thought, why tamper with perfection, but my thinking is it will happen anyway. And I hope it soars like the first one. What’s exactly the dishonesty to the novel? I was meh on the movie, but I like his thinking. The world already has way too many cash in sequels, some movies should just be left alone and not tainted by association. …I understand completely how he feels but everyone must remember ‘Hollywood’ existences only for profit. A sequel can be good, even better but this subject matter is not something that needs furthering…ie: in real life you’ve had your fling and that’s that. Really. Get over it! I think the story would fall flat on it’s face because every gay man in the world who has had a sexual relationship with an older man in his teens never will see him again??? The whole idea seems silly, the original will only get rubbished by the sequel. Mr. Hammer is a really cool guy. He’s not about money. He’s about the love of his craft and he’s a artist. I get what he’s saying. Leave it alone. Moving on. Next! Complex issue. First of all, it wasn’t only Oscar nominated, the screenplay writer won the Oscar. The oldest ever Oscar winner, I believe. For me, the novel was a mindblowing read – I didn’t want to talk to anyone for 3 days after reading it. The film had a lot to live up to. And on its 3rd viewing, made it. Kind of. 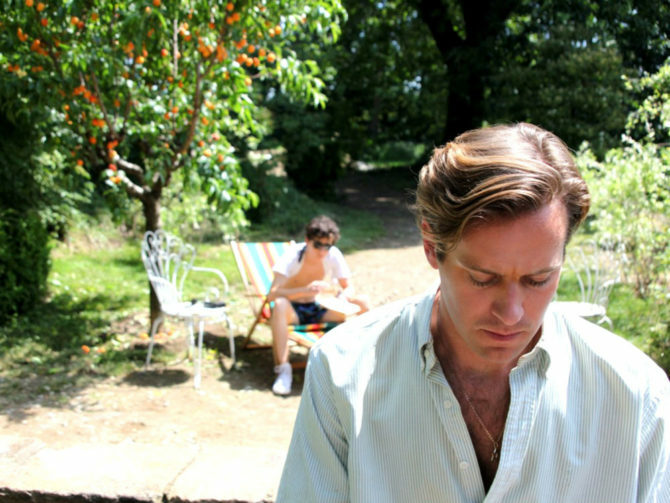 Armie was for me the disappointment of the film, not because he’s not good or lovely or loving or lovable. He just seemed too chunky to be a 24 year old grad student. And still, the idea of a sequel, as is being touted, is at best risky. I suspect that Andre Acimen and James Ivory could come up with something credible, even faithful to the first one. If they know from the get-go that Armie is not interested, they can exclude him and take Timothy on another journey. Mr Acimen’s novel, Enigma Variations, for example, could take the Timothy character on a ride. Merge these novels, somehow. Sorry, just thinking out loud. This is great news. I very much enjoyed this movie and scoffed the idea of a sequel when I first heard talk of one. I think it ended perfectly and don’t like the idea of them messing with it. I planned a whole vacation this May inspired by this movie. The cinematography was so amazing that I rented a villa and am going with my best friend to Tuscany for 2 weeks. We plan to visit Moscazzano and Crema in the Lombardy region where the movie was filmed and I bought the novel to read while I’m there. I can’t wait. I hope you have the best of time. Crema is beautiful but also visit Bergamo where the scene of their final night was filmed. Incredible hilltop old town. I too didnt like Armies role in the movie. He seemed older like mid 30’s..he acted like he didnt really want to be doing the film. Plus i thought it was very slow and too long..they couldve cut at least 45 minutes out of it..i watched it on dvd with a finger on FF…timothee was superb…the movie was his. I refuse to watch Call Me By Your Name because the actors are miscast for the roles. Because of the stalk age differences the film looks like a promotion of gay creepiness and predatory behavior. No sequel. He’s right- The first one was perfection.